…many thanks to Christos in London for the translation…. On Monday 22/12/08 around 12:10am Constantina Kuneva, the general secretary of the Janitors and Domestic Service Staff Union of Attiki, while on her way back from work, fell victim of a murderous attack by means of caustic acid. She is hospitalized in a critical condition in the intensive care unit of Evangelismos Hospital, having suffered major damage in her eyes and face, that resulted in the loss of her sight of one eye. Furthermore she is bound to suffer permanent damages on othervital internal organs and her life itself is under risk. Constantina is a woman, a mother of one adolescent child, a worker, a syndicalist and an immigrant. Despite all these, she wanted and insisted on being a true syndicalist that fought for workers rights. Such kind of arrogance could not be accepted. She should be targeted and punished!! Constantina and the Janitors Union has been trying and insisting over the past few years to pull down the curtain and disclose everything that is hidden behind the sub-contraction of services, especially in the public sector. Silence!! The state is sleeping and it doesn’t understand. The management of institutions, companies, hospitals are sleeping and they do not understand! The official trade unionism does not understand. Every day small and big crimes occur, human rights are breached, human dignity… no one understands. The minister, the hospital’s manager, the president of the institution they answer in chorus: “I do not care”. But they breach all workers rights; they do not pay us our social service contribution; they do not pay us for the hours we work; they force us to sign in blank papers with wages that they never paid us; we sign when first hired for our deliberate redundancy of the future; they register fake working hours; they do not pay us our overtime work; they do not pay their contributions for our health-risky job; and therefore we never substantiate the right to pension; they exercise on us psychological violence by threatening us with lay offs and ‘black lists’. They organize yellow unions in order us to be represented by staff managers and those obedient to the contractors. We have been stating all these everyday to the working conditions’ watchdog – the Labour Inspection service – , to the Social Security, to the highest trade union bodies. We have been trying by legal actions, as a group and individually. We ask information regarding our working relations and agreements and they claim that these are personal data!! When we do manage at last, after many efforts, to reach the ministry’s officials, in order to ask for the application of the law and for the change of the legal framework that permits mafia practices to prevail in public and private companies, they do not understand either, even if we reveal, in vain, to the ministers that the same practices occur in the sub-contraction of cleaning services in their very own ministry!! We face the same more or less treatment by SEPE and KEPEK, which we address, asking to inspect our working places. A huge file has been created by our actions against the criminal behaviour of our employers, which have been made public through the media. Everyone’s virtual answer remains the same: WE DO NOT CARE!! How is this possible? How can it be that within your ministry, in your hospital, in the HSAP (Athen’s Metro) where Constantina worked… not even these semi-laws and regulations are followed, but instead you tolerate the black holes of the contractors? Their response is disarming! “We subcontract and pay the contractors for cleaning services. Who they employ, how do they work, it is their own business, we do not care.” Constantina stood face to face with this regime, and this is the reason they gave her such an appalling answer!! Constantina is in danger. She has been now in intensive care and no measures have been taken yet to find the perpetrators of the attack! They would try once more to answer, “we do not care”. But we will insist and we will pull down the curtain as many times as it gets in order to reveal everything they try to hide. They tried to kill Constantina. AND WE DO CARE!!! We call all the employees, Greeks and Migrants, the youth that has taken the streets, every honest woman/man with dignity in solidarity and support. Lets reveal the moral and physical executors behind Constantina’s assassination attempt. Lets reveal all those that kill us everyday, because all of us, Greeks and Migrants, DO CARE!! – To find and reveal the perpetrators now. – To impose working rights and break down the ghettos of the cleaning contractors. – To get rid off the slave trade contractors in the ministries and any public service. – We call all trade unions, any organization and the employees in the Media to active solidarity. The revelation of this appalling crime is a debt of honor for every civilized human being. Bank Account for donations to the family of Constantina Kouneva. Α 40 days old infant lost her life when the plastic boat she and 18 more economic migrants were travelling with toppled due to the rough sea near the Aegean sea island Symi. The young girl did not survive and was collected by coast guard along with the rest migrants who survived. The migrants had sailed from the Turkish coast. This is one more tragic death of a minor due to the Fortress Europe shame, after the 13 year old Afghan boy who was killed some weeks ago trying to hide from the port police in Venice under a lorry travelling from Patras. 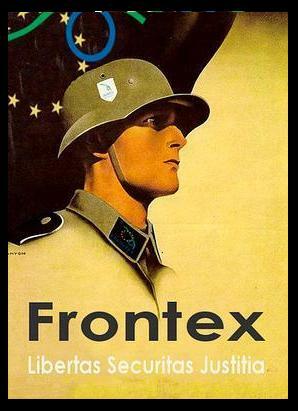 We copy below the intro of the www.fortresseurope.blogspot.com article on the EU borders deaths of migrants. The full article with the tragic account in detail can be retrieved here, at the English section of the fortress europe blog. A summary of it in Greek can be found at www.clandestina.org. At least 1,502 migrants have died at the gates of EU in 2008. The figures decreased by 23% compared to 2007, but not in Sicily, where the number of the victims rose from 556 in 2007 to 642 in 2008, coherently with an increase of 80% of the arrivals in Lampedusa. Heading for Spain, 216 migrant found the deaths in the Strait of Gibraltar and 136 off the Canary Islands, while 181 people lost their life in the Aegean sea, sailing from Turkey to Greece. Apart from the 1,235 victims of the Mediterranean, other 267 people were found dead in the desert, hidden in the trucks or in the Greek ferries traveling toward Italy, as well as under the fire of border police. Casualties at the inner city borders – 24 year old Hussein Zahidul dead near Athens Asylum Police. 24 year old Bangladeshi Hussein Zahidul was found dead on Saturday, January 3, 2009. He is the second refugee to die since October near the Asylum Police Department in Athens. He was found dead in exactly the same ditch where Muhammad Asraf also lost his life on October 27, 2008, while trying to avoid an assault by the police, which frequently attacks the masses of migrants queuing to hand their asylum applications. Between the two killings two very serious incidents of harassment took place: on 28 November, 2008 the cops beat up Ahmed Azaz and broke his hand, while he was queuing at the same department. On the same day, the Pakistani Mazehar Iqbal fell in the same ditch; he is still in a comatose condition and hospitalized. This is one more death inflicted by the ways police treat people in Greece, and one more act of violence against immigrants after the assault on Konstantina Kuneva. No matter what the police claim about “accidents” the tragic events in the now infamous Petrou Ralli ave. department are no accident. The treatment of immigrants there is no accident. It is one more manifestation of the degrading ways the Greek police, the agency which in Greece is in effect assigned with processing asylum applications, treats them. Immigrants who want to hand their applications for political asylum have to wait virtually for days and nights (usually from Friday morning until the morning after, when the desk opens, to hand out 300 priority numbers for the up to 3000 (…) people waiting there. People spend the night there, and the police beats them brutally in order to silence their protests for the inhuman bureaucracy they have to face. This is the only desk which deals with this for the whole Attica prefecture and the region around it. For so many years, no measures whatsoever have been taken by the government to ameliorate this condition. Violence is the police killing machine’s answer to people who leave their countries because army killing machines, among them the Greek one, destroy their homes and prospects. 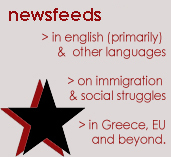 Info taken from this Athens Indymedia article. Early on January 4 a young woman from Romania died a tragic death when the slum she and two more people lived in collapsed under the rumble of mud and rocks a minor earthquake let loose. Her housemates were also injured and had to be released from the ruins. The slum, which used to be a hen-house, was unsuitable for people to live in; still, the immigrants had to pay rent for it. This tragic event brings forth the issue of the awful housing conditions many immigrants in Greece have to put up with, in this case while working this time of year on olive fields, and being subject to all kinds of exploitation. 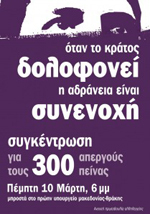 We translate below some of the texts given out by the Thessaloniki Trade Unions Center Occupation; the texts in Greek can be retreived here (Athens Indymedia article) or here,at the occupation’s blog. Here (Indymedia Nantes) is a french translation of some of the same texts.